Despite our invaluable support, Adventureland made about 15p at the UK box office. Luckily this lack of enthusiasm (and the recent downfall of Miramax) hasn’t stopped the powers that be giving it a full-on Blu release, and it ‘hits the shelves’ today. They’re still (understandably) marketing it to the Superbad crowd, but as we said in our original review WAAAAAY back in April of last year, Adventureland is enitrely its own work of genius. We watched it a second time over the weekend and it certainly hasn’t gotten any worse. 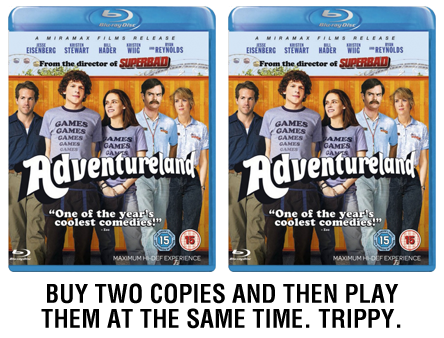 Blurby bit: Adventureland is out now to buy on Blu-ray, DVD and iTunes.